This part of Norwich has suffered as badly from post-war reconstruction as it ever did from German bombs, but this building's current appearance can be laid fairly and squarely at the feet of the Luftwaffe. This was the site of the city's original Meeting House for Friends, built in 1699 for a denomination only just emerging from the persecution of both the Commonwealth and Restoration. A church loathed by both Puritans and Anglicans must have something going for it, and the Quaker community of Norwich would become a significant one, producing bankers, architects, philanthropists and reformers. Even today, Quakers are considered an important part of the Norwich historical and spiritual landscape. This chapel was superceded in the 1820s by a grand structure nearer to the centre of the city, but remained in use. Bill Wilson, in the revised Buildings of England: Norfolk describes it as one of the largest and stateliest of the Quaker Meeting Houses, and suggests that it was built along the lines of the Old Meeting House in Colegate. To be honest, it is hard to believe that anything on that scale ever stood here, and a visit there may cause you to mourn for what is here now, because, as a plaque reminds us, Norwich Old Quaker Meeting House was destroyed in the fire storm of the Norwich Blitz in 1942. Although rebuilt in 1956, what we see today speaks entirely of post-war municipalism. The one saving grace is that the old Quaker graveyard to the east survives, and, indeed, is still in use today, uniquely in central Norwich. I must say that I find it a moving experience to wander among the still, silent graves, particularly as the old Quaker graveyard in Ipswich is currently being built over for a new hotel. The Quakers no longer worship here. Today, it is a day nursery. Part of the graveyard has become a playground, although the bold numbers on the wall denoting rows of graves survive. If Germans are to be blamed for the appearance of the chapel, its redundancy can be laid fairly and squarely at the feet of an East Anglian. Against all advice, and against the intention of the post-war Norwich Plan, the inner-ring road was rerouted several hundred metres south of its intended route by City Engineer Herbert Rowley in the 1960s. Instead of following the line of the city walls, it cuts off a part of the medieval city from the rest; that part, unfortunately, includes Gildencroft. To add insult to injury, Rowley allowed the stupefyingly ugly Sovereign House and Anglia Square to be built on this part of the medieval city, and today you really wouldn't know that the part of Norwich immediately north of the inner ring had ever been anything other than a rather gloomy suburb. 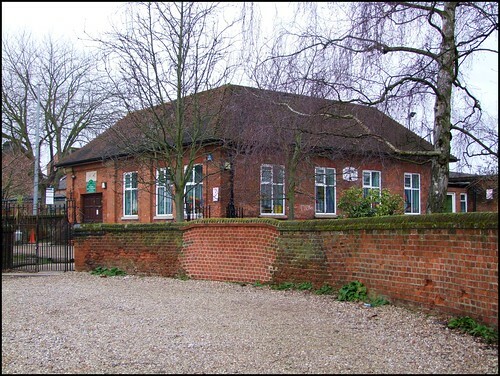 Inevitably, the Quakers of Norwich prefered to use their central meeting house on Upper Goat Lane, and this building was sold off. But who can visit it without at least a frisson for the passions of the past?